Special, finely crafted Christmas tree ornaments need a little extra care. Our Christmas tree ornament hangers will enhance the beauty of both your Christmas ornaments, as well as the Christmas tree. The hangers are a wonderful addition to your Christmas decorations and will fit with any decor. The engravable Christmas ornament hanger can be customized with personal engraving. 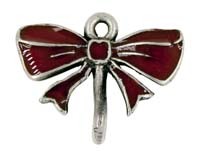 This hanger is detailed in the shape of a bow and then painted red. It is the perfect addtion to any ornament. This lovely bow hanger was designed especially for those ornaments that don't have any engravable areas. This bow hanger looks great with all ornaments and comes with two lines of engraving. A great way to add engraving or even additional engraving for a special message.